Dr. Melanie Calender, Assistant Superintendent of the Warwick School District recently presented with Bill Zee, attorney from Barley Snyder, at the National School Boards Association in Philadelphia on March 31st. 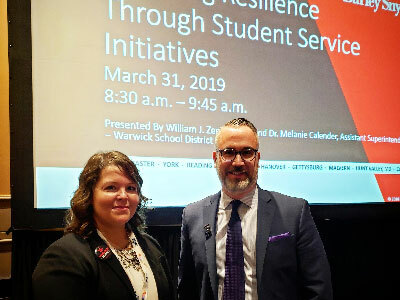 The presentation titled, "Fostering Resilience Through Student Services Initiatives" highlighted the recent work of the Warwick School District focusing on social and emotional learning, trauma-informed care and encouraging a growth mindset. Highlights of the presentation included sharing the impact of the Resilience Community Events offered annually, recent curriculum development, mental health screening, and awareness and crisis response preparations. Participants included educators, board members, and administrators from across the country. "Presenting at a national conference with Bill Zee and sharing the work of Warwick School District was a privilege and honor. His work in the area of trauma-informed care and his passion for supporting all students is inspiring. I look forward to continuing our partnership to better serve our students." Dr. Calender is proud of the work of the Warwick School District in addressing childhood trauma and encouraging resilience. She is dedicated to continuing to enhance programs that support all students.